An Elvis Biography Review … "Elvis: What Happened"
In 2007 Elvis Presley fans took special note of the thirtieth anniversary of their idol’s death. Passing completely unnoticed in the same year was the thirtieth anniversary of the most shocking and influential Elvis biography ever written—Elvis: What Happened? The book compiled the experiences of former Presley bodyguards Red West, Sonny West, and Dave Hebler, “as told to” Steve Dunleavy. The volume’s origin dates to July 1976, when the three men were fired, supposedly for financial reasons, by Elvis’s father, Vernon. The self-admitted bitterness they felt as a result of their dismissal led the three men to expose the long obscured private life of their famous employer. The book first started appearing in U.S. bookstores in early August 1977 and received an unexpected boost in sales when Presley died unexpectedly about 10 days later. 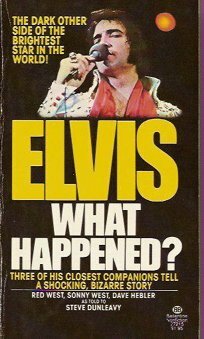 As the nation wondered why, Elvis: What Happened? offered answers to their questions. Despite the authors’ stated hope that their Elvis biography would cause the man to change his life for the better, the obvious purpose of the book was not concern for Elvis, but revenge against him. The former bodyguards’ dark vision was accomplished in little more than a year from the date of their firing. It was a quick turnaround in the book industry. The result, to be expected, was a volume totally without attribution and containing many errors in fact. There was not a single footnote in the text, and it contained not a single word from anyone else, either inside or outside the Presley inner circle, to support the authors’ many allegations against Elvis. It’s no wonder that when the book first came out, it was received with cries of “lies!” from the Presley faithful. The narrative was also lacking in dates, making it hard to nail down when events supposedly took place, and that, of course, made such events unverifiable and suspect. The names of many people who either wronged Elvis or enabled him were purposely not given. The obvious reason for omitting names was fear of libel charges, which, again, cast doubt on the stories involving those people. Finally, the text contained many qualifying expressions like, “If I remember right,” or “As I remember,” indicating the authors didn’t trust their own memories. The entire credibility, then, of Elvis: What Happened? rested on the reader’s trust in the authors’ truthfulness, which, in turn, was supported only by their stated willingness to take lie detector tests. However, the shaky foundation of this Elvis biography was greatly reinforced soon after publication. The drug-related death of Presley gave Elvis: What Happened? almost instant credibility. The book’s very title seemed to echo the question all of America was asking. And, as a steady flow of Presley confidants began speaking out in the succeeding years, many (but not all) of the allegations first mentioned in the book have been confirmed. Today the book’s text reads a bit eerily in its references to Elvis as still being alive, which he was, of course, when the book was written. Most people, however, first read the book after Elvis had died. The volume’s format jumps back-and-forth between Elvis’s productive years of the 1950s and his bizarre lifestyle of the 1970s. Presley is portrayed as a respectful and normal young man in one chapter to heighten the contrast with the next chapter’s view of his odd behavior in later years. This “give-a-compliment-and-then-take-it-away” style is also used in individual passages throughout the book. 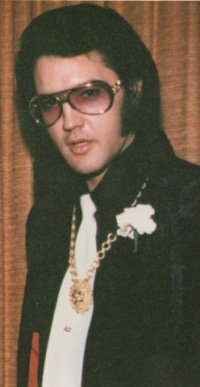 For instance, in referring to Elvis in the 1960s, Red West says of Elvis, “He would never move in on another guy’s gal—although that came later.” And in commenting on Elvis purchasing a wheelchair for a poor black woman, Sonny West states, “It was a beautiful gesture and Elvis was very capable of doing those things. And yet, he would turn around and spoil it all by some thoughtless gesture.” Even when the authors praised Elvis, an expression of their resentment was never far behind. One chapter covers Presley’s fascination with guns, something that seemed so bizarre to me when I first read it the book 30 years ago. It actually seems funny now to read about how Elvis would pull out a pistol and blast away at a TV set or a chandelier. Apparently no one ever got hurt from such behavior, although Red and Sonny claim one errant bullet almost hit Linda Thompson. Dave Hebler felt such carelessness with guns revealed Elvis’s total lack of self-control. The idea that Elvis never matured to the point where he would take responsibility for his actions is a theme that is repeated throughout the book. According to Sonny, he and the other boys around Elvis did nothing to help their boss grow up. “I was so locked into Elvis,” says Sonny. “It was second nature for me to stand up for him, even when I knew he was very wrong.” An incident in 1963, (since verified by other sources) when Elvis threw a pool cue into the chest of a young woman is cited as an example of how Elvis never took responsibility nor apologized for his actions. “He never likes, he loves,” wrote Dunleavy, “he never dislikes, he hates … Presley lacks the maturity to avoid extremes … he has been constantly wrapped in his celebrity status, packaged and sold to adoring millions. There was no need to develop maturity.” The implication is that Elvis’s “adoring millions” bear some of the responsibility for hindering the maturing process in their idol. The revelations in Elvis: What Happened? 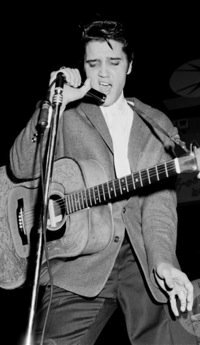 about Elvis’s gunplay and strange spiritual notions were certainly shocking to Presley’s fans, who had long seen him as a normal young man who had fulfilled the American dream. Still, they could be dismissed as mere quirky behaviors. However, there were other revelations that could not be so easily dismissed, even by his fans. The charges of Elvis’s drug use and dependency were the most startling and unbelievable allegations in the book. Red West revealed the now accepted fact that Elvis was introduced to Dexedrine in the army while stationed in Germany. According to Red, Elvis liked the pills because he “liked what they did for him.” He and his boys continued to use the pills after returning to civilian life. Red even claimed that Elvis was high on the pills while filming most of his movies during the 1960s. But Dexedrine was only the beginning. By 1971 Elvis was a “walking drugstore,” according to Sonny. One of the most disturbing stories in this Elvis biography, one that has stayed fresh in my mind all these years, is the one about a pretty, young woman that Elvis picked out of the crowd one night in Las Vegas. Later, she nearly died after a night of drinking a dangerous prescription drug, Hycadan, fed to her by Elvis at his Palm Springs home. (Others have since verified the story.) If Red and Sonny’s account is true, Elvis callously blamed the girl for drinking too much of the drug. The bodyguards, in effect, portrayed Elvis as continually using drugs in increasing numbers and potency from then on. Red West: “His system doesn’t work anymore like a normal human being’s.” Sonny West: “There is a whole sickness thing that is going to happen to him. His system is just shot to hell.” Dave Hebler: “Elvis is committing ‘slow suicide’ with the drugs … It seems he is bent on death.” Of course, his death within two weeks after the book’s publication, gave credence to those statements, which would have appeared ridiculous had he not died at that point. It is unclear how much of Elvis: What Happened? Presley read before he died. However, he knew the book was in the pipeline and had read portions of it, according to Elvis biographer Peter Guralnick. Elvis’s reaction? “Alternating waves of rage and shame,” says Guralnick. In the end, though, reading the revelations of his former bodyguards did not cause Elvis to change his lifestyle, as the book’s authors say they hoped would happen. Even on the last night of his life, Elvis was more concerned with protecting his image than improving his health. In Careless Love: The Unmaking of Elvis Presley, volume 2 of his Elvis biography, Guralnick says Elvis briefly discussed taking action against his former bodyguards. It was not legal action he spoke of, though, but a decidedly illegal one. “He spoke once again, too, of the plot he had hatched to kill Red and Sonny by luring them to Graceland on one pretext or another—but he didn’t seem about to do anything about that either,” wrote Guralnick. "For a long while after Elvis’s death, I considered my long friendship with Red West to be over. He and Sonny’s book had created such a painful situation, it was hard to see how that rift could heal. But years after Elvis was gone, I bumped into Red on a Memphis golf course, and he asked if he could talk to me privately. As we started talking, I noticed that Red, a tough guy who hadn’t ever run from a fight in his life, had tears in his eyes. He said he wanted to apologize to me and to all the other guys, and said that he hated 'the damned book' and wished that he’d never had anything to do with it. He said that since the day the book came out, it had been nothing but a nightmare for him … Red’s words were moving to me. I told him that I accepted his apology and that I’d speak to Joe and Jerry and Richard and Charlie. It took some time, but they accepted Red back as a friend, as we all believe Elvis would have eventually." "Because it first pealed back the layers covering Presley’s bizarre private life, it clearly was, and still remains, a significant Elvis biography."